The proud owner of a new pair of Chanel shoes. Designer brands are popular here. Most students have a designer something, even if it’s just one pair of sunglasses or a bag. This is primarily because AUS is expensive, so the students who can afford coming here without scholarships are financially comfortable enough to afford designer brands. And some enjoy showing it off. I will never forget the day I accidentally kicked some girl’s Prada bag that she brought to class, nor how happy I was that she didn’t notice. Yes, some students actually use Prada bags instead of backpacks. The first conclusion I jumped to was that everyone with designer brands is rich. This isn’t the case. There are no taxes in the UAE, compared to around 35% income taxes in the US, not to mention sales tax on every American purchase. No taxes frees up more income for more shopping. Although some people buy designers without a second thought, most people see it as an investment. As one girl put it, she would rather pay extra for a quality shirt she loves, instead of a cheap shirt she just likes. However, she was referring to purchasing from Zara versus Forever 21, not Prada versus TJ Max. Although a university hoodie and shorts were in fashion back home – with the occasional person in their pajamas – that would look out of place here. Students at AUS put effort into looking good, and this ranges from girls wearing a pound of make-up and a designer abaya, to girls who fashionably select their clothes at Splash (slightly cheaper than Forever 21, and often made fun of for being cheap), with everything in between. The key isn’t spending tons of money on an outfit, rather it’s putting the outfit together well. So for those planning on coming to the UAE, bring clothes that look presentable and go well together. Leave the extra pajamas and sweats at home. Or if you’re feeling adventurous, you can get an abaya and wear whatever you want underneath. I have three, and each one is a new excuse to not get dressed in the morning. Using broken cement blocks as stepping-stones across the treacherous river. 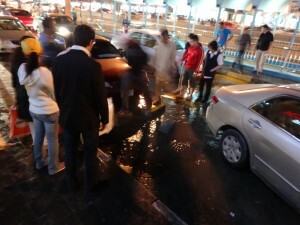 In Dubai, there are supposed to be only 5 days of rainfall a year( 1 ). This however did not stop some confused clouds from wandering over to the Dubai-Sharjah area and releasing their contents for a week. The expulsion of liquids began November 17th, when the students all across campus suddenly heard the thundering of raindrops on the roof. The downpour quickly resulted in an all-out flood. Over-protective employees discouraged students from leaving buildings because it was ‘too dangerous’ outside, but I chose to take off my shoes and wade through the flooded parking lots anyways. But the campus is floored with highly polished granite tiles, so walking over them while wet was about as graceful as learning how to ice skate. Students – only those without classes, of course – took this opportunity to use the ground as a gigantic slip and slide, and Instagram was later filled with videos of students swimming across campus. Sadly, I could only recover videos of them doing push-ups in the rain( 2 ). 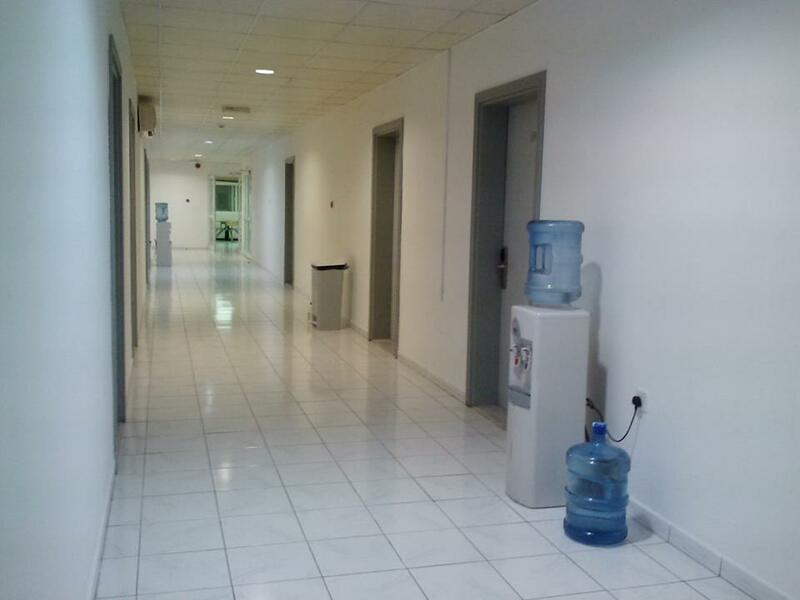 In the aftermath of the storm, university was cancelled due to ‘dangerous conditions’, the student center was evacuated, and buckets stood guard on the floor collecting water that dripped from the ceilings. When I tried leaving the dorm on the weekend, the dorm supervisor discouraged my venture into the ‘dangerous conditions’. This was reasonable, since the roads had been turned into pools and the only water-drainage system – the burning Arabian sun – was currently not operational due to interference from clouds. People took advantage of this opportunity to engage in water sports, an option usually not available to people who live in a desert( 3 ). 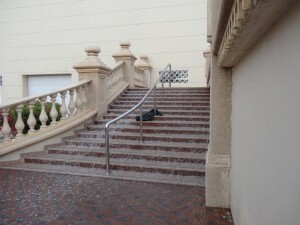 A dangerous waterfall that spontaneously formed on the stairs at AUS. ( 1 ) Dubai Page Information on Dubai’s weather. ( 2 ) Instagram Video Push-ups in the rain. ( 3 ) Facebook Video Video from Al-Ain of a man on a motorboat in the street. How Do I Uh… Get There? Getting around in the Emirates is surprisingly easy. If you’re crazy and want to rent a car, have fun, but taxis, metro, and buses are everyday options. Transportation here is much cheaper than in Europe, plus it’s safe. The only bad experience I had was when I was alone in a taxi, and the driver tried to convince me to go all the way to the other side of Dubai so that he could make more money. Taxis are perfect for short-range transportation. However, they can be expensive for longer distances, unless it’s one of the vans that seats seven people. Otherwise, taxi drivers try to be strict about the four passenger limit. However, if all five friends pile in at once, they usually complain for just a couple seconds before taking you all to your destination. Taxis are best for traveling around the Emirate you’re currently in, since crossing borders costs extra (around $6), and the trip may be more expensive than by bus or metro. Taxis can be booked by calling +971600525252 and pressing one when the answering machine starts talking in Arabic. 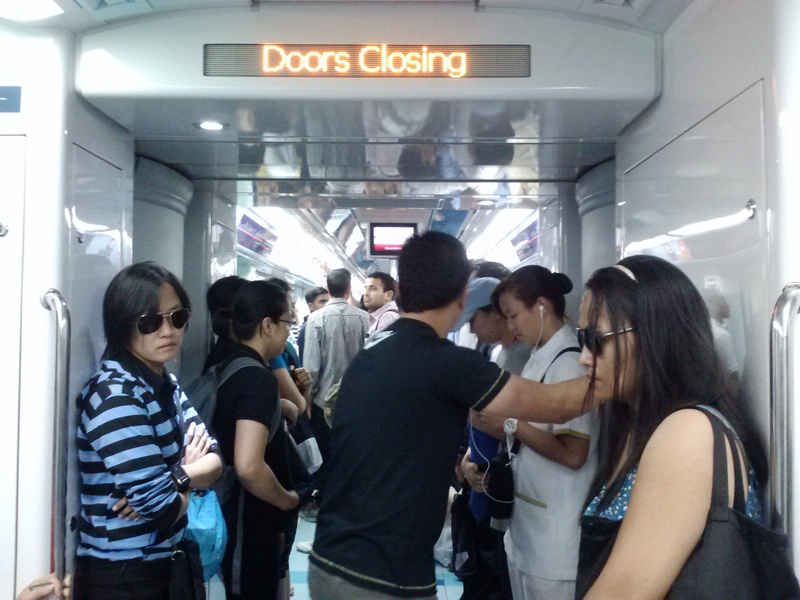 The Dubai metro is only faster than taxis when there’s traffic. Otherwise, it’s pretty slow, and a one-way ticket costs around $2.50 (8.50 AED), which is usually the cheapest way to travel. 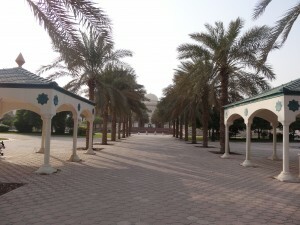 AUS offers a bus service to the metro, and students often take a taxi from campus to the Rashidiya metro station, then complete their journey with the metro. However, taking a seven-seater cab can be cheaper and faster than the metro. AUS offers a bus service to Abu Dhabi, Al Ain, and Dubai. Dubai tickets are $2.80 (10 AED) for one way, but otherwise must be bought in bulk. Four complete trips to Al Ain or Abu Dhabi cost $82 (300 AED) in total, but the regular bus may be cheaper for a one-time visit. The AUS buses buses don’t stop until they get to their destination, and only leave and return to campus once a week. They’re designed for students visiting family on the weekend. Public inter-city buses leave from the Blue Souq in Sharjah, and a one-way ticket to just about any other emirate costs only $8 (30 AED). To get to this station, a public bus can be taken from the stop in front of AUS all the way to Al Rolla Square, which is in walking distance of the Blue Souq. That ticket costs only $1.30 (5 AED). More information is available at the Sharjah Transport Website, with buses on most lines leaving multiple times a day. For those who prefer a taxi to the Blue Souq, the cost is around $10 (35 AED). As for inter-city taxi rides, these are best for large groups of people or those who just can’t stand public transportation. A one-way ride from Abu Dhabi to Sharjah can cost around $68-$81 (250-300 AED), making inter-city buses much cheaper. Travel in the Emirates can be extremely cheap. Plus, signs and announcements are almost always in both Arabic and English, so the only language required is English, even for communicating with taxi drivers. The accent of a native-English speaker is hard for taxi drivers and the like to understand, so I suggest speaking in simple sentences – perhaps even broken English – and an Arabic accent if possible. Me and a friend at a surprise birthday party on a yacht. Students go abroad for a variety of reasons. It’s important to know what you want before you go abroad, to make sure that you walk away with your mission accomplished. One reason for study abroad is academics: specific subjects might not be available back home, like Islamic Banking, Politics of the Arab States, or upper-division foreign-language classes. Another reason is to take super easy classes for a semester and have fun in a foreign country. Others just want to fulfill study abroad requirements. It’s important to find people you like and click with, and stepping out of your comfort zone can help this happen. But, you might have to reevaluate your study abroad goals based on the people you meet. 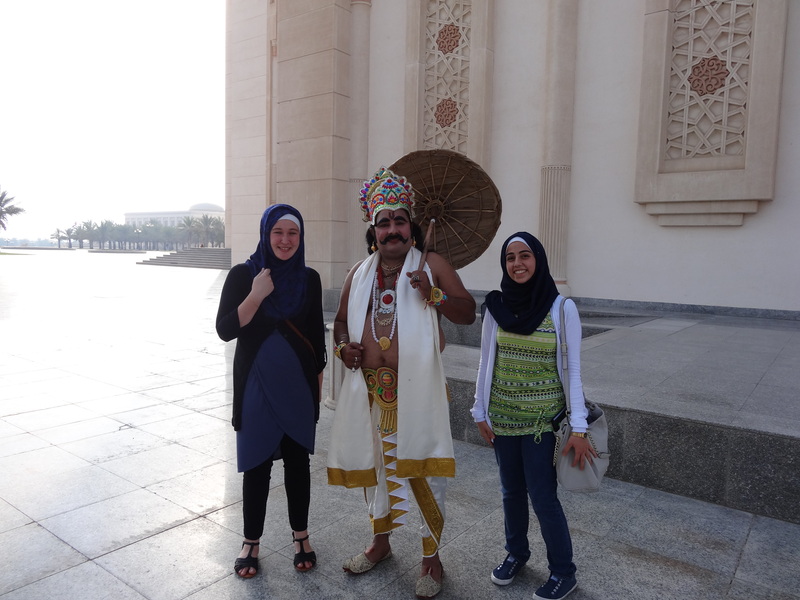 I went abroad expecting all of my friends to be Emirati, with my goal being learning about Emirati culture. I’m good friends with one Emirati, but Emiratis are only 20% of the university population, so the rest of my friends are from all over the place; plus, I’m a junior and all of my friends are freshmen. But the important part is I’m having a worthwhile experience because I’m around people I enjoy spending time with. Some exchange students are in the UAE for academics, so of course they sacrifice a social life for an education not available back home. Other students are here for the fun aspect, and living it up with other exchange students. One girl is actually preparing for a career in competitive sports, so she spends most of her time in the gym. I was surprised that not many exchange students integrate into the university community, especially since every piece of study abroad advice is somehow related to making local friends. The easiest group to make friends with is the other exchange students. But, for those feeling more adventurous, here are some tips for making local friends. Find out how people keep in touch. People in the Middle East love WhatsApp (WhatsApp Website) and Blackberry Messenger (BBM Website). It’s not awkward to ask people for their number the first time you meet them. Try to spend as little time as possible in your dorm room. The longer you’re outside, the more people you meet. Exploit the first weeks of classes. This is when people are most willing to meet new people. Going up to a person sitting alone or to a group of two people in the food court is an easy environment to start a conversation. Think of anything to start talking about. If someone is playing music you like in the dorms, knock on their door. If they’re wearing a shirt you like, ask them where they got it. If they have dyed hair, ask them about their natural color. Talk to people you see multiple times a week, like classmates. If you hit it off, then it’s more likely a friendship will take root than with someone you click with but never see again. Find out what people do in between classes and try to do it as well. For example, students at my university sit in the Student Center and chit-chat. Don’t get insulted easily, and be forgiving. Remember you’re talking to someone from another culture, so something that’s rude back home might have no social baggage in the host country. There’s a hose in all of the bathrooms here. It’s attached to the wall next to the toilet, and has a nozzle on it like the one in the shower. 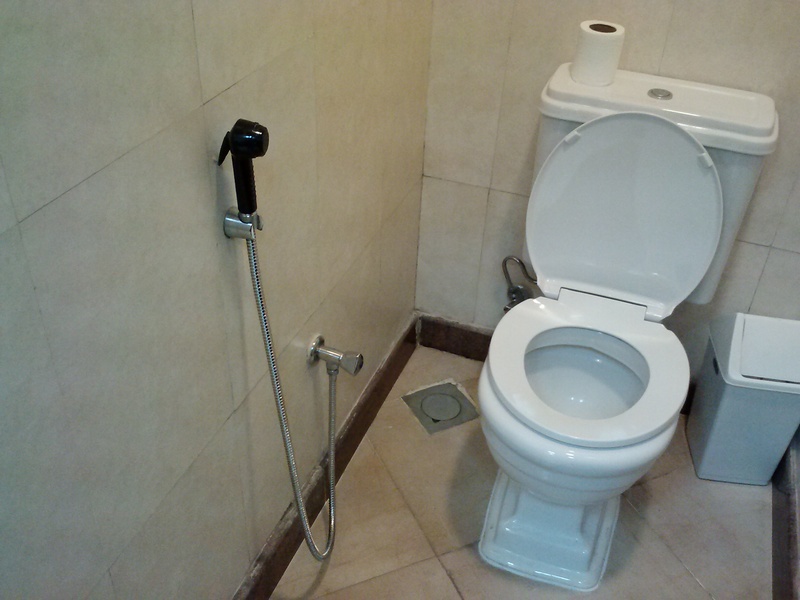 You can turn it on and control the water pressure by with the handle, and people use it to clean their private areas after using the restroom. Since we don’t have anything like it back home, here’s a short instructional guide. Step one, go to the bathroom. Step two, before using toilet paper, hold the hose a short distance from your private area and spray yourself. Step three, use toilet paper. In case you want a video tutorial, scroll down this guy’s blog post (Tales from an Expat), although he uses it without toilet paper. The hose leaves you feeling refreshed, plus you need less toilet paper for the same level of cleanliness. People here actually think it’s gross to use the restroom without the hose. They will even take a glass of water into the bathroom with them if there’s no hose. It’s kind of like switching from dial-up internet to DSL; there’s no going back. There’s about three of these per hallway, or 48 per dorm block. The hottest topic upon arrival amongst the exchange students was water quality. Please, leave your water purifiers at home. You don’t need them here. Desalinated ocean water comes from the tap, and is used for all washing purposes. This is not supposed to be consumed, but I did it anyways for about a week with no side-effects. Bottled water is used for food preparation, completely safe, and there is a healthy supply of it all around the country. In the AUS dorms there are multiple bottled water dispensers in every hallway, and almost every academic building has a bottled-water vending machine in it. The machines cost 1 Dirham, or .27 cents per 600 ml bottle of Aquafina water, making it super cheap to stay hydrated. I’ve also eaten fresh and canned fruit in this country, and never had any side-effects. I even used tap water to clean the fruit. Street vendors are non-existant, and even take-out from grubby-looking places has been safe. I only once felt something similar to food poisoning in the Emirates, and it was after dinner at an American restaurant. So much for worrying about food quality! Palm trees: scratching posts for stray cats. At the moment of sunset, an army of stray cats appears on campus. They are usually fed by the security guards, meaning they think every person is a food dispenser and are not shy of people. They’re perfect for the animal lover who misses home. On a related note, my friends and I were walking home at night when suddenly we heard a scream and saw a blur running up a palm tree. A cat had chased a mouse up the palm tree. To get down, she dropped the mouse and landed on top of it before scuttling away to eat in peace. I didn’t know mice could climb palm trees. Or that cats could run, not climb, straight up them. AUS’s Student Multicultural Learning Program sponsored a trip to the Mall of the Emirates to watch a presentation by the Korean Embassy. 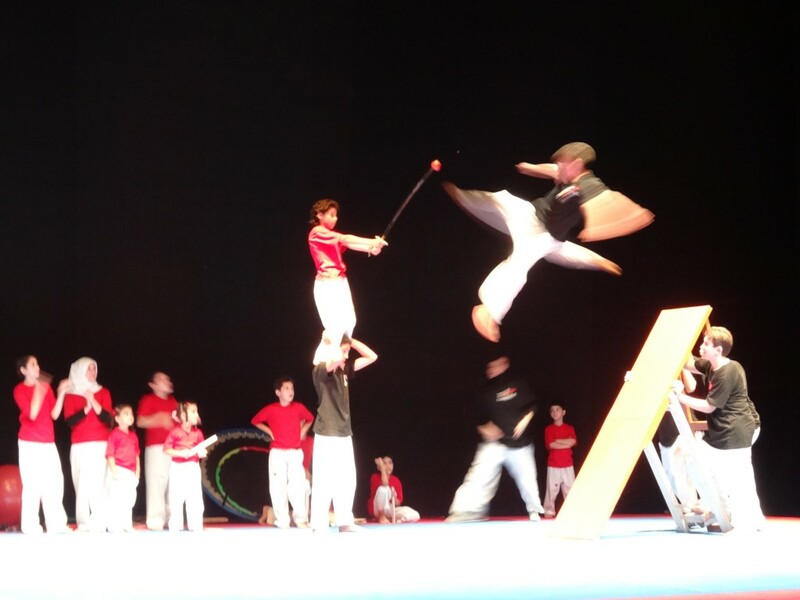 It started with a taekwondo demonstration from Arab athletes, complete with adorable little children performing stunts. 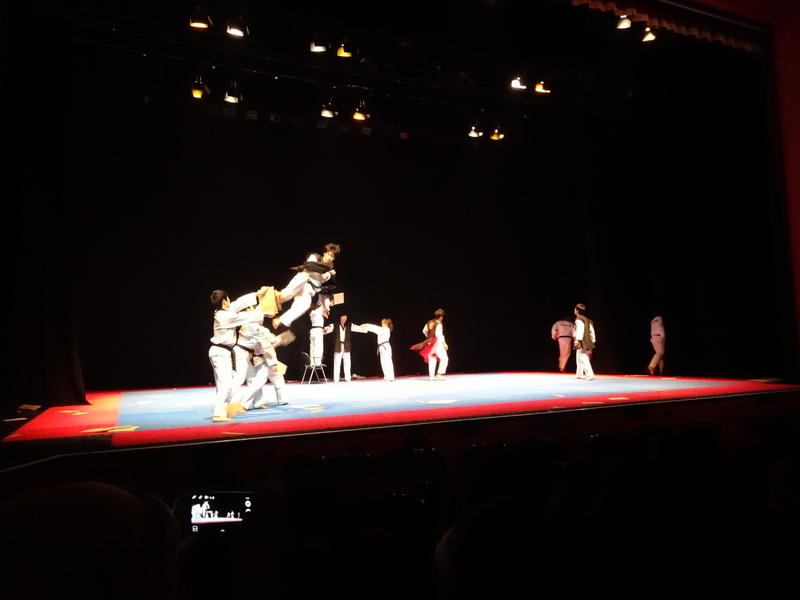 Then, what can only be described as Korean opera music started playing, and South Korean taekwondo althetes began a professional taekwondo demonstration, which was almost a play. It was a touching story of good versus evil, with emotions displayed only through occasional shouts, facial expressions, and music. Then they just started showing off their skills, which included kicking flowers while blindfolded and kicking apples so hard they exploded. 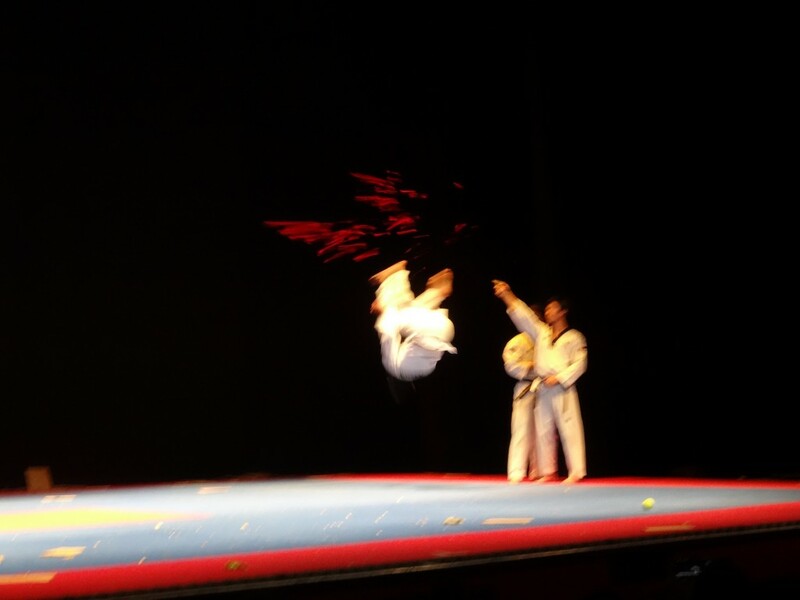 They also demonstrated their ability to kick through pieces of wood, the shreds of which were flying into the crowd. After a couple of traditional dances, a techno-ish song started playing and the crowd went wild. 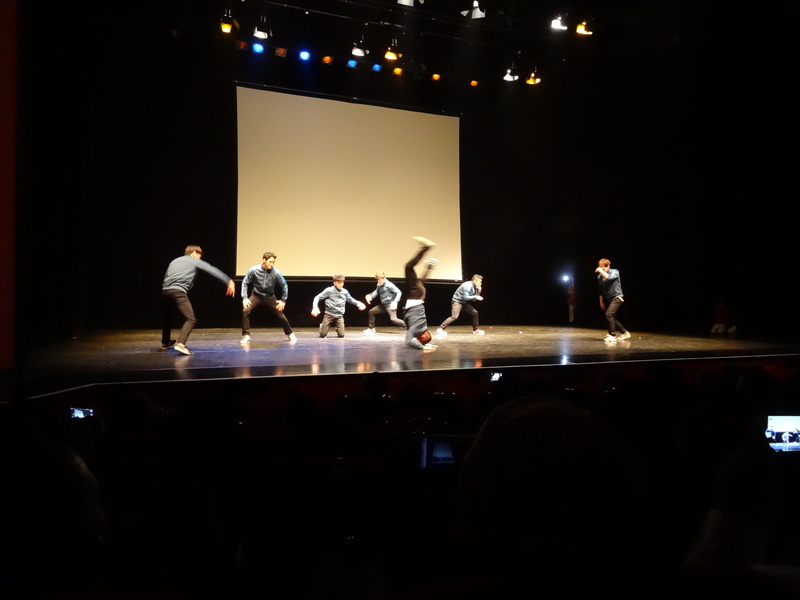 This was the cue for Gamblerz Crew, a famous breakdancing group from South Korea, to begin their performance. 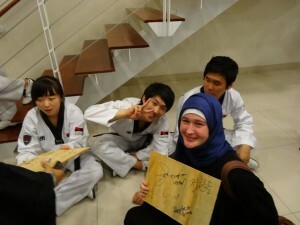 After the shows, the taekwondo athletes were signing the boards they didn’t destroy during the performance. The mostly-male athletes stood out as white dots among a flood of abaya-clad Emirati girls, all of whom fought to get their signatures and pictures. 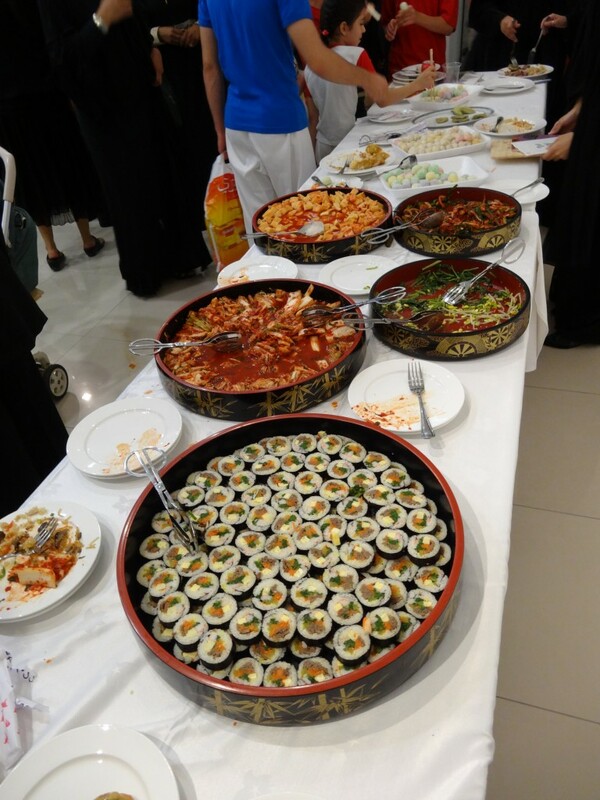 There was also an all-you-can-eat buffet of Korean food, with a gigantic platter of sushi. The rest of this post is pictures of the event. This young man jumped off the board to kick the apple on a stick. Not a normal on-campus occurence. This man was strutting his stuff across university campus. 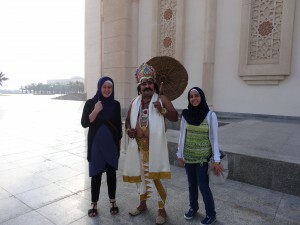 He said he was impersonating the King of India. No idea what that’s supposed to mean. Although this guy is an extreme example, it’s common to find culturally diverse clothing on campus. Some Pakistani girls wear traditional Pakistani dresses, which are like tunics with a slit on both sides of the bottom. Many Indian girls wear a long thin scarf draped around their necks. But, Western clothing is the most popular. Meeting fashion stylist Farah (center left). Because the UAE is so small, great events are within an hour’s driving distance. 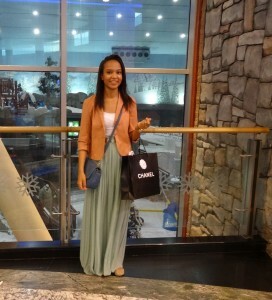 We went to Vogue Fashion Dubai Experience (more information) at the Dubai Mall, and got to meet stylists in person. The two stylists we met were Farah (Dress Code by Farah), a personal shopper, and Ascia (Hybrid in a Headpiece), a fashion blogger. 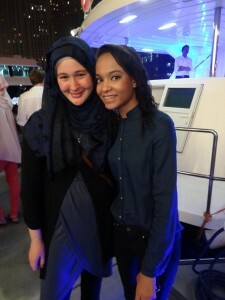 Ascia helped popularize wearing hijab in a turban-style, and apparently fashion blogging is popular here. They gave us all a tour around Bloomingdale’s, a tutorial on wearing Ascia’s turban style of hijab, and had a short question and answer session for styling different items. We actually got to have a personal discussion with Farah, and she was very open about her life. She is an image consultant, and focuses on helping men and women improve their image by first learning to love themselves, and only then by finding clothes. It was amazing to talk to her, and she was truly inspiring. She used to clean rich peoples’ houses to make money before creating a name for herself in the fashion industry. The best part of the event was meeting a woman who came from an Average Joe background, and is now living the American dream. Except that she’s doing it in the Emirates, perhaps making it the Emirati dream? Plus, the event was free!